Congratulations to Sheela Castillo and Ging Valdez, winners of this giveaway! Thank you to everyone who joined! There is a first time for everything! 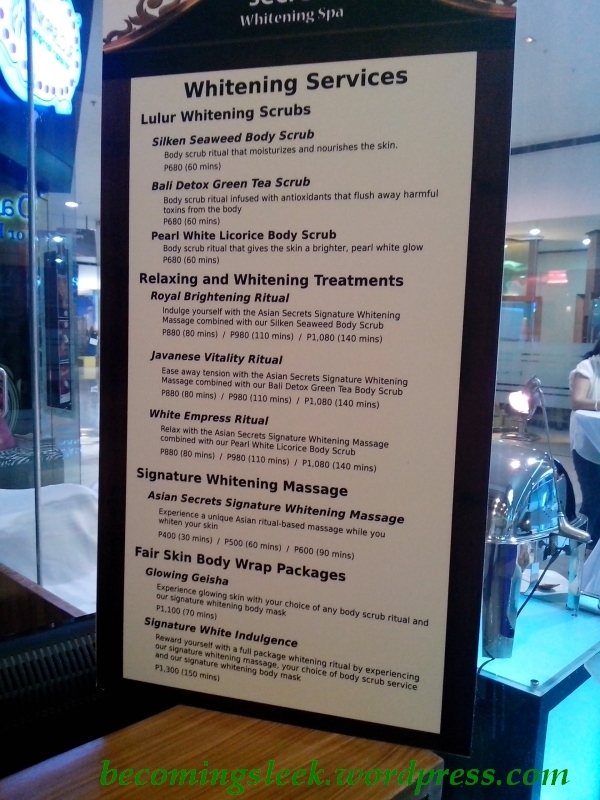 And for me in this case, my first spa experience courtesy of the newly opened Asian Secrets Whitening Spa at SM North The Block (5th Floor). 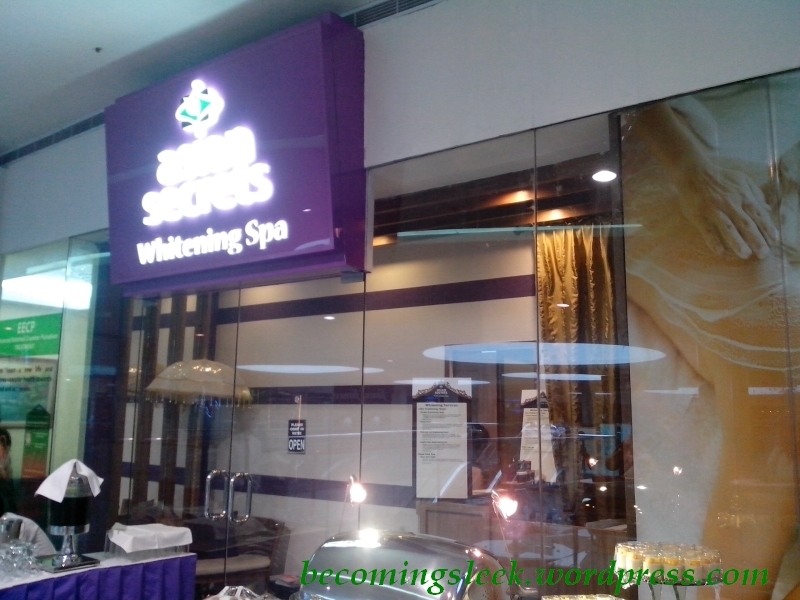 The name sounded awfully familiar, and as I arrived at the venue I realized why: it is the exact same company that gave us the Asian Secrets Lulur Whitening Body Scrub. This product has been making the rounds in the local beauty blogging sphere, and much praise has been given to the product. 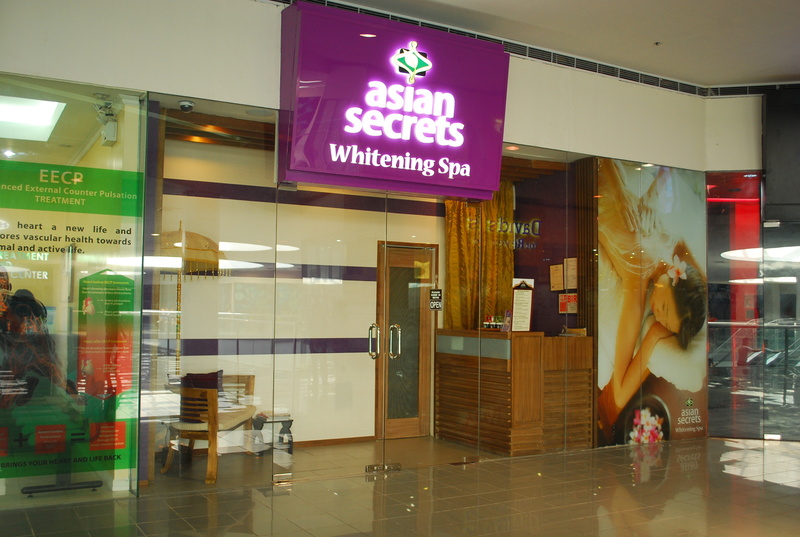 Luckily I was invited to try out their new Whitening Spa, featuring their new product the Asian Secrets Lulur Whitening Facial Scrub. This is basically their version of the body scrub but specifically for the face. I received the signature facial scrub service which included cleansing, scrubbing (with the abovementioned facial scrub), hot compress, mask, moisturizer, and face and shoulder massage. As I was wearing makeup when I arrived they also removed my makeup using remover wipes. All of these lasted for about an hour, after which I was offered hot tea or water as post-treatment drink. 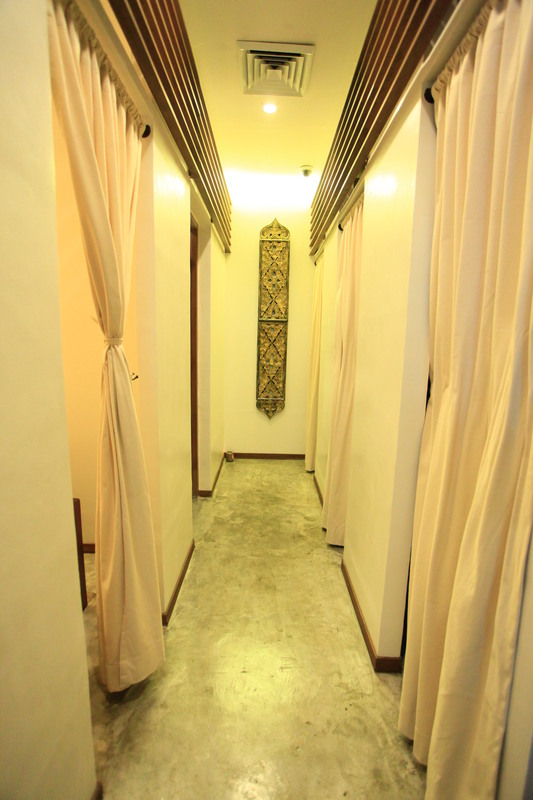 Check out the press photos below of the facade, spa hallway, and treatment cubicle. As a first timer, my experience could not have been any more soothing and relaxing. I did not know what to expect out of spas, but my attendant Angel was quite forthcoming of all the steps in the treatment and kept a very soothing presence. All aspects of the treatment felt really good, and the products smelled nice. There was relaxing background music of the right level of loudness (which turned into random bird sounds later on), and the light was pleasantly dimmed. 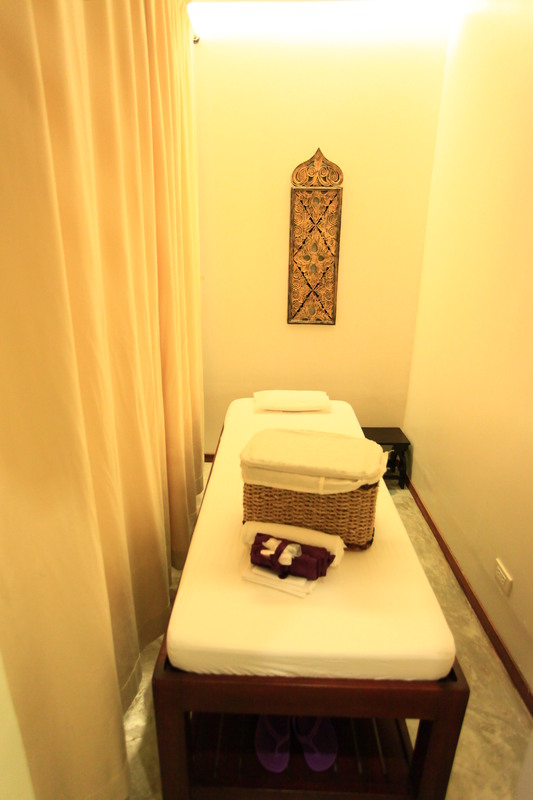 Each cubicle has its own treatment table, and I was provided a clean white sheet to cover my chest (I needed to unrobe since the treatment included a shoulder massage). I was also provided a nice cloth-lined wicker basket to store my things while I was undergoing treatment. Perhaps the only thing that I thought weird was since I had the front-most cubicle, the front door recessed into the wall of my cubicle whenever someone entered/exited the treatment areas. It was a little disturbing, but not really experience-breaking. All in all I enjoyed my first spa experience! 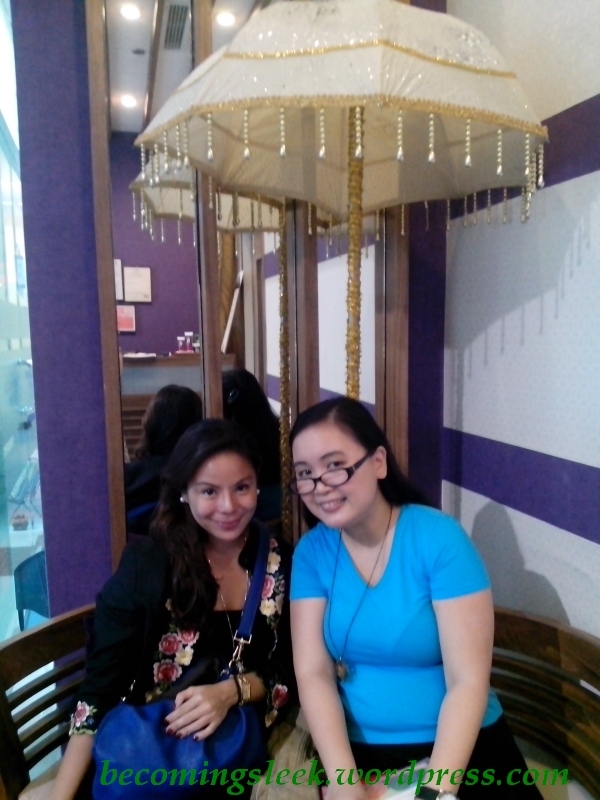 Thank you to Asian Secrets and Marcie Linao for this opportunity. 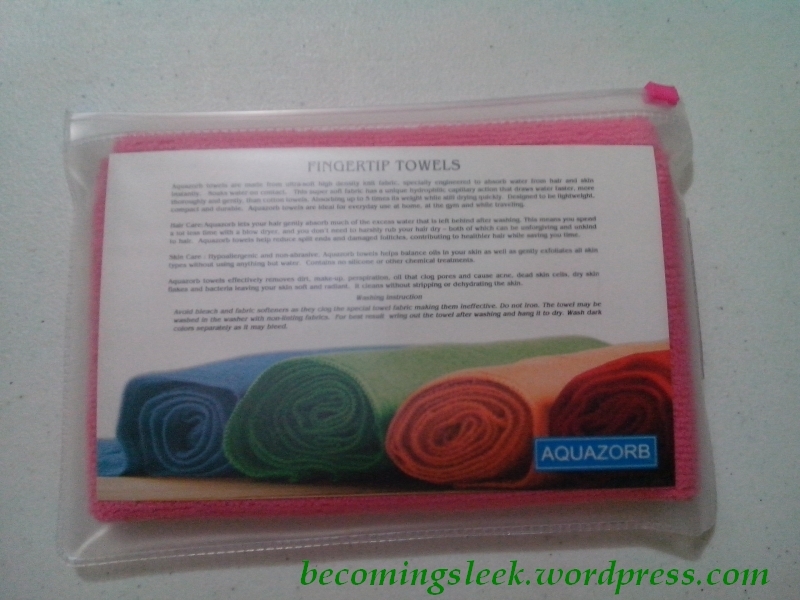 I was even provided an Aquazorb face towel and two tubes of the Facial Scrub so I can continue trying the product at home. I am very glad to share this experience with two of my readers! 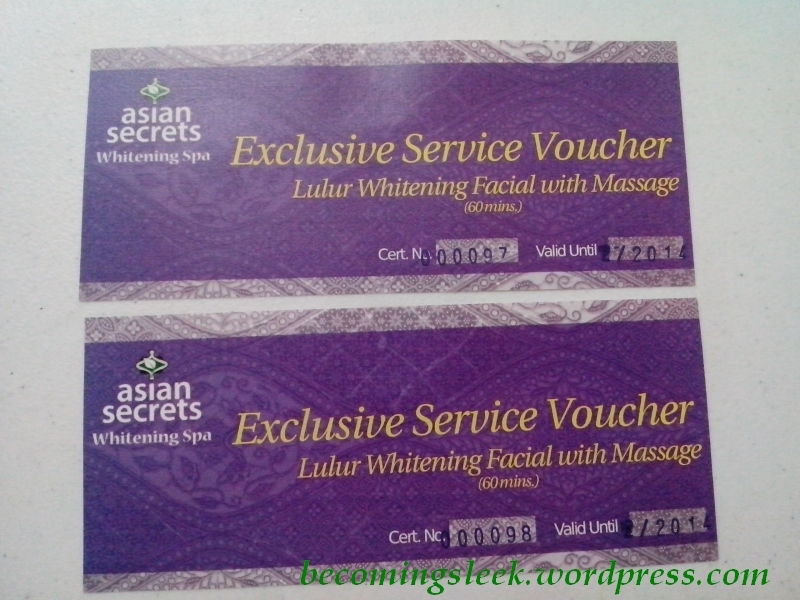 Each of them will receive the Lulur Whitening Facial with Massage (60 minutes) for free! How do you win? Just follow the steps provided in the rafflecopter widget linked below. Take note that the first three steps are mandatory, and not fulfilling those will disqualify you from winning. Make sure to read and follow the rules stated below. Contest runs from today until November 5 midnight Manila time. The winner will be randomly drawn using Rafflecopter. I will be announcing the winner on this blog as well as on the Becoming Sleek facebook and twitter pages once I evaluate the entries, and will be notified through the provided email address. She/he will be given 48 hours to respond after which I will draw another winner. Readers 18 years old and above are allowed to join. I will ship the voucher to the winner. Philippine addresses only! Check back daily, some of the entries can be done everyday. Disclaimer: The spa service, products, and vouchers were provided for free for my consideration, but I am not required to write about it. All opinions are mine. A big thanks again to Marcie of Love and Light Productions for the invite! The Beauty Junkee’s 5th Anniversary Giveaway! Win a Jergens Gift Pack!